In September 2015, we visited Tanay municipality (Rizal Province, Luzon Island, the Philippines), where INAM Philippines supports healthcare. 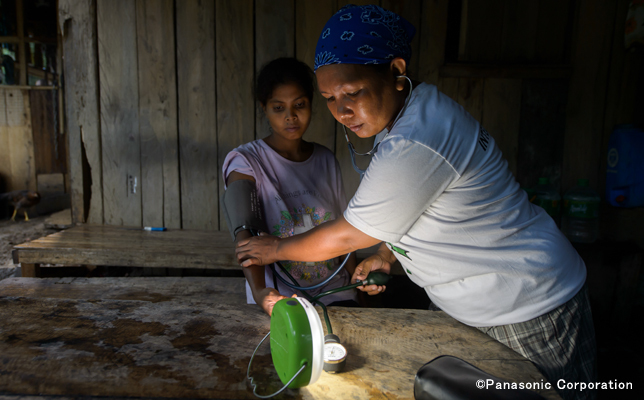 Solar lanterns provide light for health checkups in dark homes of villages that have no electricity and no doctors. Integrative Medicine for Alternative Healthcare Systems (INAM) Philippines, Inc. works with communities to provide integrative healthcare services to those who lack the financial means to seek medical care and to those living in villages that have no doctors. 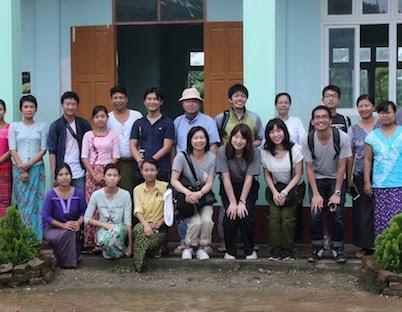 Through INAM, these people receive integrative medicine and basic health skills training using herbal medicine (locally available herbs in the communities), natural remedies and traditional treatments like acupuncture. Thanks to low-cost treatment, poor people living in cities and rural areas who could not previously see doctors can now receive quality basic healthcare services. INAM headquarters in Quezon, Manila. Here, INAM offers consultation and treatment for people who cannot afford treatment. INAM also dedicates its efforts in participatory healthcare as a way of providing healthcare services in villages that have no doctors. Through them, nurses and midwives, as well as volunteer community health workers selected from their own villages, are trained to address healthcare needs in their respective communities. In addition to traditional treatments and first aid, the training spans a wide range of subjects, from community organizing, training of community health workers and community health program management. Community Health Workers are trained on identifying priority community issues/problems, recording or documentation of the services provided to the community members and connecting or referring patients to health professionals and other healthcare facilities. Recently, solar lanterns were donated to the villages (sitios) of Magata and Manggahan in Barangay Laiban in the Tanay municipality of Rizal province on Luzon Island. These off-grid villages are located in the mountainous region east of the capital Manila and are home to several hundred indigenous people. We were surprised to discover poor areas without electricity such a short distance from the capital. Here, it is not uncommon for the simply-constructed homes to have the roof blown away by strong winds or to leak in the rain. 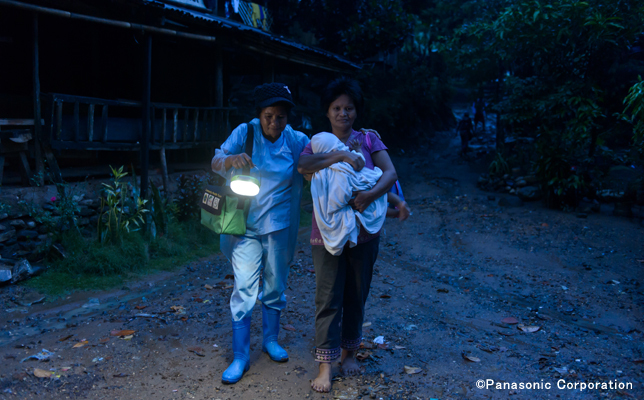 The solar lanterns were being used at clinics and during house calls. 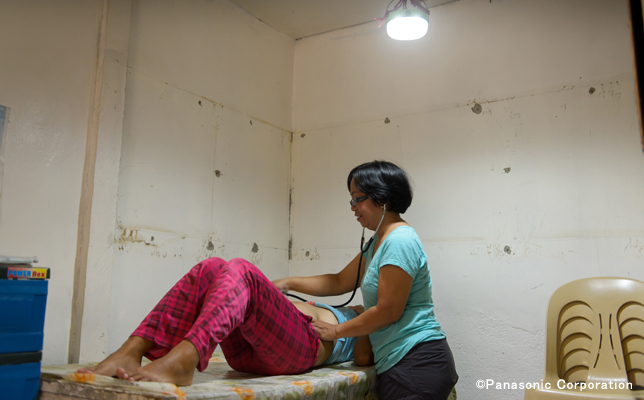 Solar lanterns being used for prenatal checkup at the clinic. It is dark outside by the time staff make home visits in the evening. Solar lanterns are a big help. In villages without clinics, community health workers visit each home to weigh and measure newborns and children, to check the temperature and blood pressure of patients, prescribe herbs and other medicinal plants, and bandage patients who have injuries. Solar lanterns help in many situations inside the homes, many of which are dark even during the day. Community health worker measuring blood pressure at a patient's home. 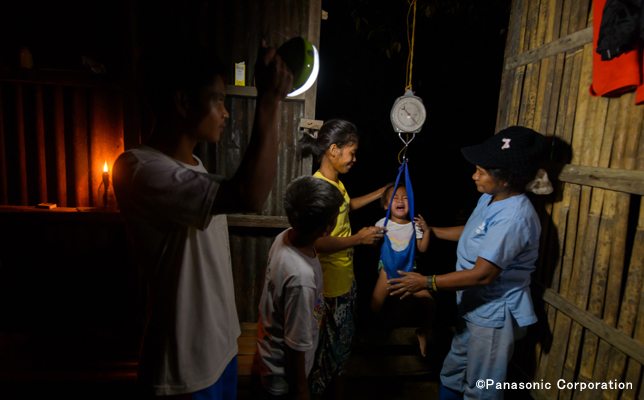 The baby's exact weight can now be read thanks to the light of the solar lantern. The two villages we recently visited are located deep in the mountains and can only be accessed by crossing a river by rowboat and climbing a mountain. Many indigenous communities such as these are scattered throughout the mountains and many do not have a doctor. For these villages, community health workers and others capable of addressing local healthcare are a must. 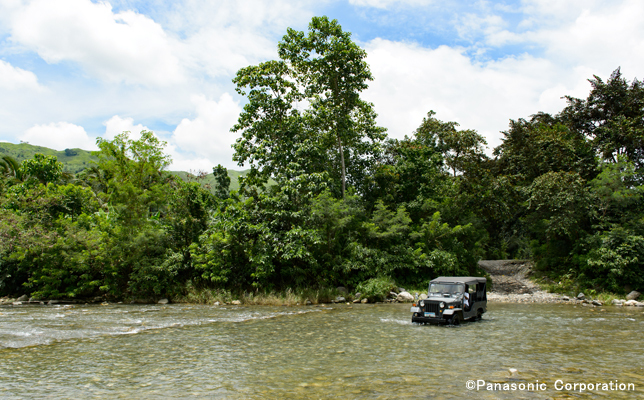 We must cross many rivers by car, boat, and foot to get to villages deep in the mountains. Light provides a foundation for these people to carry on with their lives. 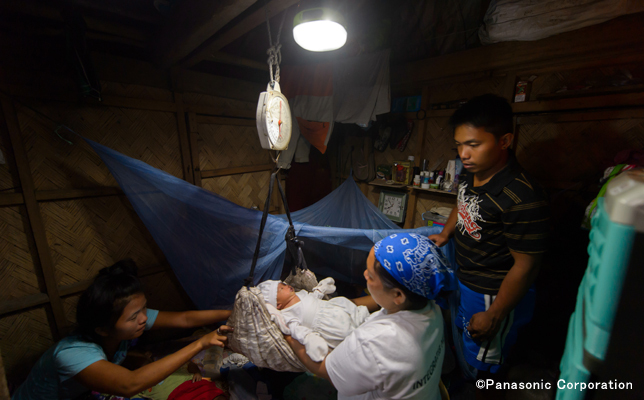 Panasonic will continue to support local health workers by donating solar lanterns to help bring health and smiles to many people.